The Pathfinder Guide to West Sussex and the South Downs Walks contains 28 fantastic circular walks across the county, much of which lies inside the new South Downs National Park. Walkers of all abilities can experience a variety of walking routes in a range of difficulty with this Pathfinder guide which takes you from gentle riverside strolls to hikes along the exhilarating South Downs Way. Each walk in Pathfinder Guide to West Sussex and the South Downs Walks is accompanied by clear, large-scale Ordnance Survey route maps and GPS waypoints to make your walk as stress-free as possible. 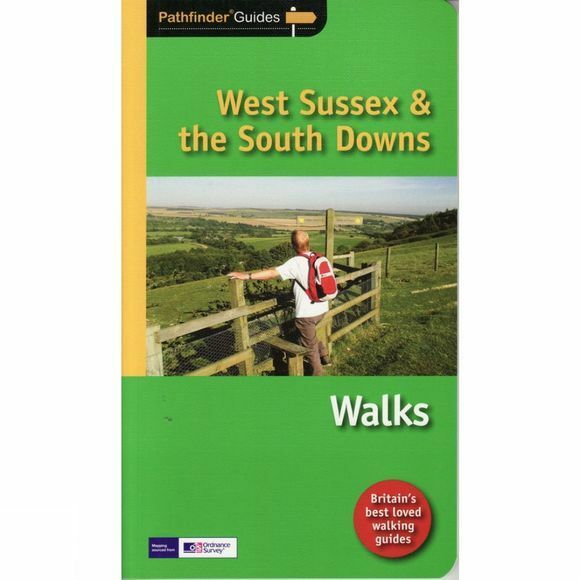 Pathfinder Guide to West Sussex and the South Downs Walks guides you to some of the best walking destinations in the county, from the highest point in the South Downs National Park to the brooks of the Arun valley and the historic harbour at Chichester. Inside you'll also find a wealth of helpful information accompanying each walk, including good pubs along the way, where to park before you start your walk and places of interest en route. Pathfinder Guides are Britain's best loved walking guides. They are the perfect companion for countryside walks throughout Britain. Each title features circular walks with easy-to-follow route descriptions, tried and tested by seasoned walkers and accompanied by beautiful photography and clear Ordnance Survey mapping. The routes range from extended strolls to exhilarating hikes, so there is something for everyone.